Here are all the exciting things to do in Henderson, Nevada, close to Las Vegas. Families will be thrilled with a water theme park, friendly trips to the Grand Canyon by coach or airplane, the Hoover Dam and a trip to the Clark County Heritage Museum. 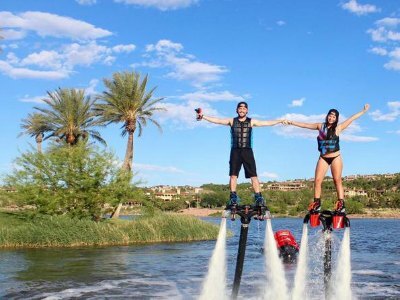 There are numerous heart pounding activities that range from flying in an acrobatic airplane, ziplining, ATV journeys and there are plenty of watersports that can be had at Lake Las Vegas. You can try your luck at the Emerald Island Casino or tour the Las Vegas Distillery and there is plenty of shopping as well as dining options within the District at Green Valley Ranch Resort. Outdoor and wildlife adventure can be found at the Lion Habitat Ranch, the River Mountain Loop Trail; the Henderson Bird Viewing Preserve as well as at the Sloan Canyon National Conservation Area. 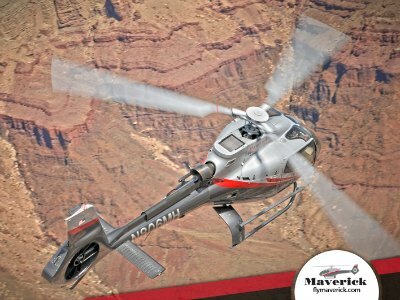 One of the most interesting and fun filled things to do in Henderson for travelers who are looking for a bird’s eye view of the Grand Canyon, Hoover Dam and Lake Mead National Recreation Area is to take one of the specialty tours offered by Maverick Airlines. You can relax and watch from above on one of Maverick Airlines five flying tours which will take you over some of the most astonishing places on earth. There are standard flights where you soar above the landscape taking photographs while you relax in a Beechcraft 1900D or Cessna Grand Caravan 208 airplane. Other tour options include landing and a walk on the glass bridge named the Skywalk or you can decide to continue to the bottom of the Grand Canyon with an add-on helicopter flight. Once you land at the South or West Rim of the Grand Canyon you will be afforded plenty of time to explore your surroundings before you set back to the skies on your way home. When you get tired of the Strip and want to do something interesting as well as fun then a great thing to do in Henderson are the activities at Lake Las Vegas. Once you are at Lake Las Vegas there are exciting watersport activities where you can get a little exercise like standup paddleboarding and kayaking. If you feel like being acrobatic and raise your adrenalin level then you should try Flyboarding where you will be dong flips above the water in to time at all. For a relaxed and leisurely time at Lake Las Vegas you should rent a Duffy Electric boat and have a picnic or early dinner on the water. No matter what kind of watersport adventure you are searching for we think you will find one at Lake Las Vegas. If you have ever wanted to be a fighter pilot and experience the action of air combat then the best thing to do in Henderson is to try the Top Gun and Air Combat Experience. Your adventure begins with complimentary hotel pick-up service where you will be driven to the Henderson Executive Airport where you will meet your expert pilot and listen to a brief safety meeting. From here you will board a Waco Extra 330 LC airplane which is equipped to maneuver through the sky at high speeds while performing incredible acrobatic feats. You can decide if you want a 10-minute recon flight which has you soaring above the Mojave Desert and viewing the Las Vegas skyline. Another option you have is a 15-minute flight which will have you doing loops, spins, tumbling and stalls. When you want to have the real experience of being a fighter pilot then you need to choose the Top Gun package which will have you in the sky for 50-minutes in a simulated dog fight that is realistic and complete with smoke when you register a hit. During Top Gun experience you actually get to take control of the airplane and complete unbelievable maneuvers in the sky while you try to shoot down your enemy. This excursion is perfect for competitive friends who want to feel the adrenaline of a realistic dog fight. Your tour concludes with free drop-off service at your hotel. 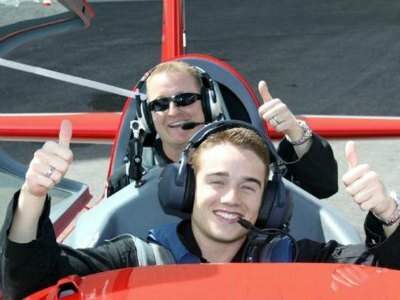 An exciting adrenaline filled and an ideal thing to do in Henderson when you want a different view of the Mojave Desert and the Las Vegas skyline is to take a flight on the Fighter Pilot Recon Experience. Your flying adventure begins with complimentary hotel pick-up where you will be taken to the Henderson Airport where you will meet your expert pilot. 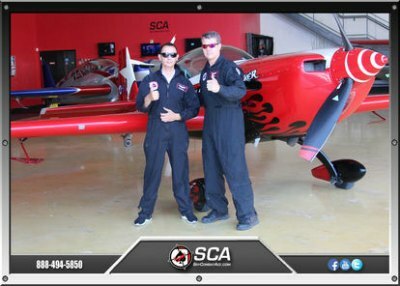 After a brief safety meeting you will climb aboard a 330LC Waco biplane which is an acrobatic racing type airplane seats two in the front so bring a friend if you choose. After takeoff the fun begins when your adrenaline starts to reach new highs as fly over the Mojave Desert and surrounding mountains. During your flight you will have marvelous views of the Las Vegas skyline. During your landing you will need to take a deep breath when your pilot maneuvers the aircraft in a military style elongated spiral which will knock your socks off. Your flight experience ends with free drop-off service at your hotel. 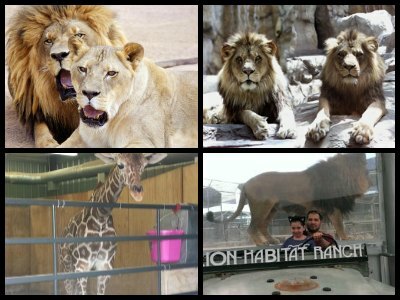 Nature and animal lovers of all ages find a trip to the Lion Habitat Ranch is a perfect thing to do in Henderson for learning more about big cats and their natural habitat. The Lion Habitat Ranch is situated on 8.5-acres and features 40 African lions that can viewed by the general public in a variety of ways. There are several packages for visitors to choose which range from a back of the scene tour with a specialist to feeding the big cats to just walking around watching these amazing animals play. While you are at the Lion Habitat Ranch you can learn about the different conservation tactics being used around the world to save these magnificent animals. Also residing on the ranch is Ozzie the giraffe who is an expert at painting interesting pictures while you watch. 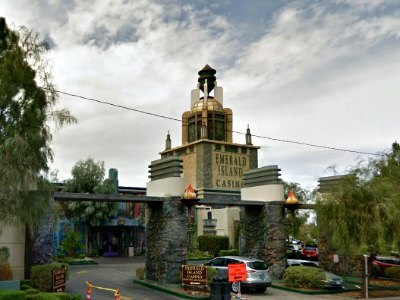 If you like to gamble but don’t want to break your vacation budget, then a superb thing to do in Henderson is to stop at the Emerald Island Casino. The emerald Island Casino will fascinate you once you enter the facility with numerous murals depicting life in Ireland. From this cultural transformation you can head straight to one of the 400 gaming machines that range from video poker to video slots to keno. Don’t worry because the price is right with each game costing a penny to play. Enjoy the excitement of gambling while playing some of the newest and hottest electronic gambling games in the world. When you get hungry you can stop by the Emerald Island Grille where you will find tasty daily specials and a reasonable priced menu of international dishes. Trying one of the many tours at Above All Las Vegas ATV and Watercraft Rentals are a great thing to do in Henderson for families who are searching for outdoor adventure. You will be thrilled with the variety of activities that is offered by Above All Las Vegas ATV and Watercraft Rentals which range from a guided ATV tour to ziplining to horseback riding to watercraft rentals. 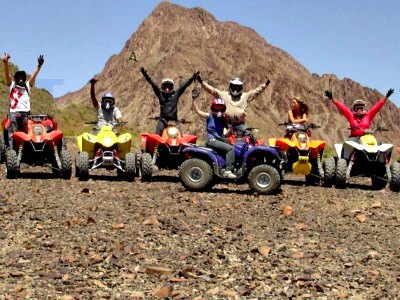 There are guided ATV tours to Eldorado Canyon, Mount Charleston as well as the Valley of Fire or you can choose to rent an ATV and create your own outdoor adventure. Other opportunities include horseback riding in Red Rock Canyon and there is even an evening ride that includes a western BBQ. Adrenaline junkies can soar through the air on a zipline course at Bootleg Canyon which has over 1.56-miles of cables that includes a 2,546-foot run. If you are looking to get out on to Lake Mead or Lake Mohave, then Above All Las Vegas ATV Tours and Watercraft Rentals have just the right equipment for rent with jet skis and Bayliner boats. One of the best things to do in Henderson for foodies and families who like chocolate is to take a trip to the Ethel M Chocolates Factory and Cactus Garden. 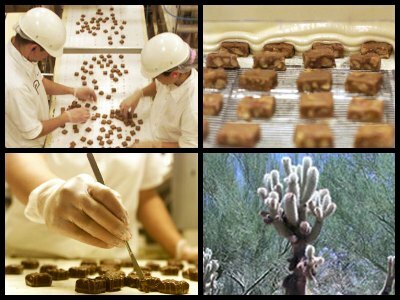 Once you enter the Ethel M Chocolates Factory and Cactus Garden there a variety of activities for you to enjoy from learning how to make chocolate in one of their classes to viewing the factory while employees make award winning chocolate based on the Mars family recipes. When you are finished viewing the self-guided tour of the factory you can enter the tasting room where you can indulge in the many different chocolates delights created at the factory. Another portion of the Ethel M Chocolates is the cactus and botanical garden. You can take a stroll through the garden area while viewing a desert landscape filled with 300 species of plants from around the world including Southwestern United States, South America and Australia. The beauty of the garden is enhanced flowering plants, trees and shrubs which thrive in the dry climate of Southern Nevada. For travelers that are interested in learning more about the history of Nevada’s southernmost county then a great thing to do in Henderson is to visit the Clark County Heritage Museum. Located on 30-acres the Clark County Heritage Museum contains thousands of artifacts and numerous exhibits that concentrate on the early Indian tribes in the area, the influence of the railroad, mining and gambling. 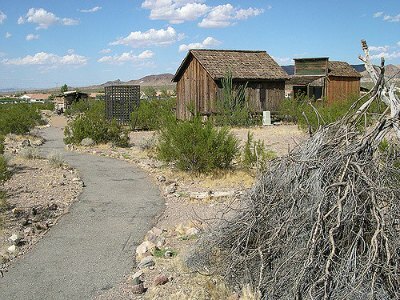 As you walk the grounds you will have an opportunity to view exhibits that feature artifacts such as arrowheads, historic photographs, mining equipment, railroad locomotives, the 1932 Boulder City train depot as well as an 1898 Dewy slot machine. Some of the previous exhibits housed at the Clark County Heritage Museum include the Tribal Treasures which featured pottery from the Pueblo Indians, Training the Gunners at the Las Vegas Army Air Field during WWII and Tops and Toes which concentrated on fashion. Also within the grounds are eight historic houses along Heritage Street which feature period furnishings and plenty of interactive signage to help explain the significance of each house. 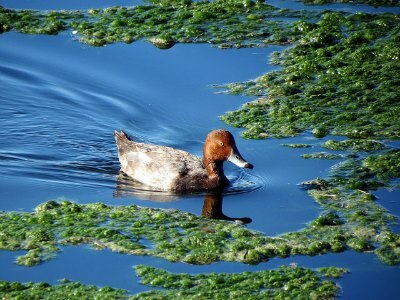 If you are a bird watcher or just like to view wildlife then an excellent thing to do in Henderson is to take a trip to the Henderson Bird Viewing Preserve. Situated on 140-acres within one of the many water reclamation facilities in the area, the Henderson Bird Viewing Preserve features thousands of migratory birds from over 200 bird species. When you visit the area you can view the birds at nine different ponds which are surrounded by either pavement or soft ground. There is a ¾-mile trail which features numerous interpretive signs about the various species of birds you can see which range from the American Avocet to Black-necked Stilts to Spotted Sandpipers to Lucy’s Warblers and you can even see some Desert tortoises. There are guided tours available in the morning hours led by qualified biologists and you can purchase a bird viewing guide at the gift shop. 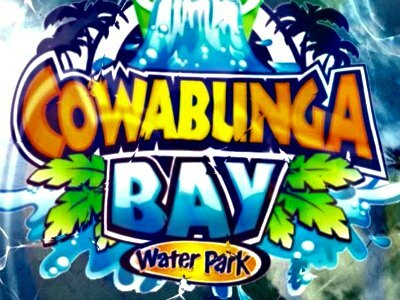 One of the most entertaining things to do in Henderson for families and visitors that want to escape the heat of the summer is to go to Cowabunga Bay Water Park. Located just minutes from Strip, Cowabunga Bay Water Park resides on 25-acres with 30 water slides, a wave pool, a cabana pool, a children’s area and a lazy river. The water theme park is fashioned after a 1950s and 60s beach blanket party with a fun atmosphere which is ideal for families. While you are visiting the Cowabunga Bay Water Park you can experience such water slides as Surfin’ USA, Wild Surf, the Breaker and a 72-foot drop while sliding down the Zuma Zooma. Other attractions include the Children’s cove with specialty water slides for the young ones, the Surf-a-Rama wave pool, the Cowabunga Lazy River and you can relax like a king at the Cabana-a-Rama pool in your personal cabana. There are carnival style games and several restaurants that can help create a carefree day of water fun for the whole family. 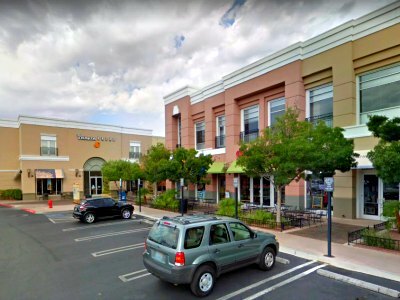 The District at Green Valley Ranch is a superb thing to do in Henderson which can help you relax in an environment that features plenty of shopping and dining opportunities within a pedestrian friendly outdoor mall. Once you are at the District at Green Valley Ranch you can walk the cobblestone streets or sit in one of the many grassy areas enjoying a nice day away from the glitz and hustle of Las Vegas. When you visit you will be pleased with more than 30 shopping venues that range from outdoor equipment at REI to children’s clothing at Jeanie and Jack to home furnishings at Williams-Sonoma to health and beauty products at AVEDA-Gianna Christine. Dining offers plenty of choices with Rachel’s Kitchen, King’s Fish House and the Balboa Pizza Company as well as fifteen other eateries. Throughout the year the District at Green Valley Ranch also hosts a variety of events that range from a farmer’s market to an evening of wine, beer and food from local businesses. 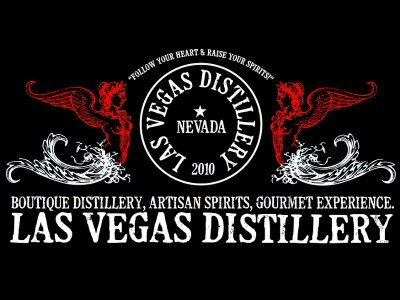 The Las Vegas Distillery is a perfect thing to do in Henderson for all types of visitors who are interested in tasting some great distilled spirits. When you visit the Las Vegas Distillery you can learn about the distilling process of whiskey and vodka as you take a guided tour of the facilities with an expert guide who will teach you about the history of distilled spirits in the Las Vegas Valley and Nevada. As you tour the grounds you will notice two huge copper kettles which starts a traditional artisan type distilled spirit from grain to bottle. The tours also offer a variety of tastings which range from seven styles of vodka to numerous whiskeys. When you are finished with your tour and tasting you should stop by the gift shop where you can purchase a unique bottle of distilled that was produced at the Las Vegas Distillery. When you are interested in getting outdoors to hike, bike, horseback ride or another type of outdoor activity then a super thing to do in Henderson is to take a trip to the River Mountain Loop Trail. Designated in 2010 as a National Recreational Trail, the River Mountain Loop Trail is 35-miles in length and encircles the River Mountains. 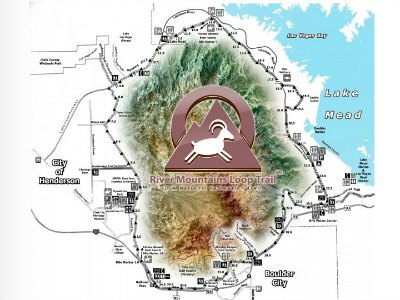 The multi-use trail is ideal for all types of recreational opportunities and connects the Lake Mead National Recreation Area, Boulder City, Hoover Dam, Henderson and the Las Vegas Valley. The trail has plenty of interpretive signs to help you learn about the wildlife and eco-system of the greater Las Vegas Valley as well as a variety of other items such as the Old Spanish Trail. In addition there are portions of the River Mountain Loop Trail which are dog friendly and a 15-mile section which can accommodate horseback riding. Trail heads vary from primitive to full facilities so plan ahead with water, food and other necessities. One of the best things to do in Henderson when you want to get out and enjoy the natural surrounding and some interesting ancient rock art is to plan a trip to the Sloan Canyon National Conservation Area. 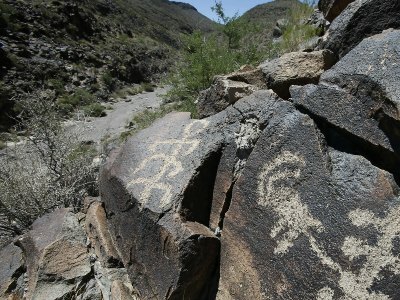 Created in 2002, the Sloan Canyon National Conservation Area encompasses more than 48,000-acres of fascinating geologic formations and over 300 rock art panels that contain over 1,700 individual components which date from the Archaic to historic era. Also within this conservation area you will find superb hiking inside the North McCullough Wilderness Area and numerous miles of challenging biking trails as well as opportunities for horseback riding. In addition to these outdoor activities you can simply view the wildlife which ranges from Desert Bighorn Sheep to Grey Fox to Red-Tailed Hawks and you might spot a Desert Tortoise.